From the New York Times, 6 Jan. 1941, "East Orange, N. J., Jan. 5 - Elmer S. Burnham, founder and retired president of the E. S. Burnham Packing Company of New York, which he established in 1890, died here last night at his residence, 67 Watson Avenue, after a short illness. Born in Deerfield, Mich., 87 years ago, he was a grain broker in Chicago before entering the packing business. A son, S. M. Burnham, lives in Florida." The subject of this notice was Elmer S. Burnham (1855-1941). 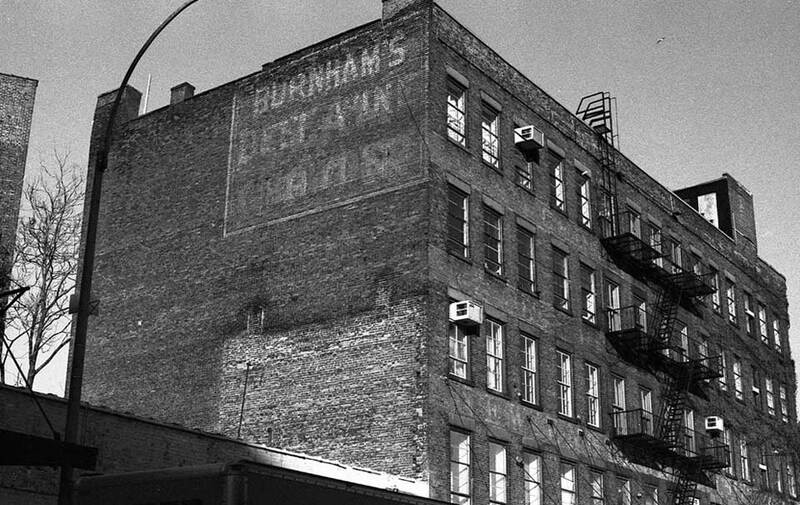 Burnham's in New York began as E. S. Burnham Co. Manufacturers Grocers' Specialties at 120 Gansevoort St. around 1894, and moved to 53-61 Gansevoort in 1897. They were located here until 1929. Their products were groceries, produce, and druggist sundries. Apparently the sundries included medicinal tonics and extracts, as well as clam bouillon. This is the top of a flyer for Burnham's Great Restorative Tonic combining beef, wine and iron. The bottom of the same flyer mentions Burnham's Clam Bouillon. Regarding Burnham's bouillon The American Druggist and Pharmaceutical Record of 8 October 1900 (vol. xxxvii, no. 8) wrote, "It was conclusively proven in the Spanish-American War that the Clam Bouillon of the E. S. Burnham Company was an invaluable preparation, both as a food and as a tonic. When arrangements for supplies for hospital use were being made by the Red Cross Society, and careful investigation was made by the society into the respective merits of every product, the E. S. Burnham Company was among the favored number and received a small order for their Clam Bouillon. Within a short time they received duplicate orders ... With the public Burnham's has been a popular article for several seasons..."
This notice for Burnham's Clam Bouillon appeared in The Medical Current, vol. x, 1894. A similar ad appeared in the Medical Record, 27 June 1903. The Marco Island Florida.com website says that E. S. Burnham established a clam factory at Caxambas on Marco Island in 1904. Marco Island is located on the southwest coast of Florida near Naples. Another Burnham product was a forerunner to today's jello, a powdered dessert gelatin called Hasty Jellycon. This ad for Hasty Jellycon can be found in the Google digitized book, Tried and True: A Collection of Approved Recipes (p. 192), published 1907. The Gansevoort Market Historic District Designation Report (New York City Landmarks Preservation Commission, 2003, pg. 167) describes. "the unusual flatiron-shaped store-and-loft building at 53-61 Gansevoort Street (1887, Dunn), which housed E. S. Burnham & Co., clam canners." The report gives the following information on Burnham: "E.S. Burnham & Co. / E.S. Burnham Packing Co., canned goods and, later, druggist sundries, remained in this location until around 1929. Elmer S. Burnham (c. 1854-1941), born in Michigan, began as a grain broker in Chicago prior to establishing his packing business. Among Burnham's products were clam chowder and clam bouillon. From 1905 to 1929, the E.S. Burnham Packing Co. operated a clam cannery on Marco Island, Florida."